We did it! After 9 months of development, 2 months in beta and 2,000 hours of development time, the most powerful automation plugin for WordPress is now available. You can get it right now from only $49 annually at https://automatorplugin.com/. So what is Uncanny Automator and why do you need it? Automator lets you create “recipes” that perform things automatically on your website. When something happens, something else happens. Maybe a user logs in for the first time and you send them a welcome email. Or maybe a user purchases a product and submits a form and you add them to a course and set a tag in Infusionsoft. Personal learning paths, marketing automation, even routine admin tasks – they can all be set up to run automatically on your website to save you time and give your users a better experience. 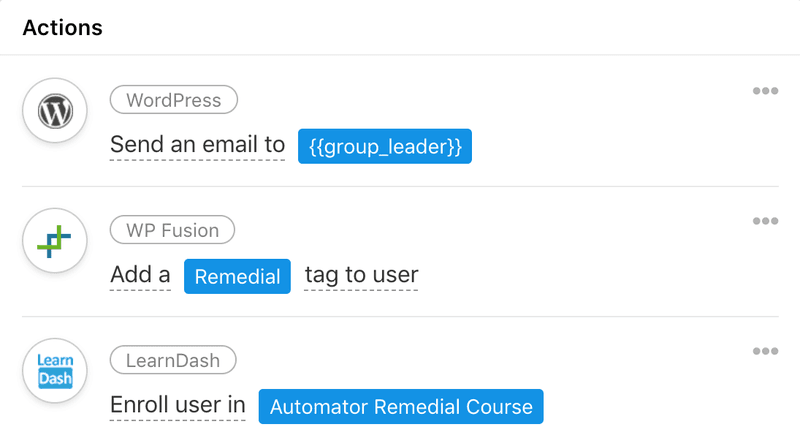 To create these time-saving workflows, Automator connects the plugins that are already on your site together. Whether you use WooCommerce, BuddyPress, Gravity Forms, LearnDash or many more, Uncanny Automator connects your plugins so that they can “talk” to each other. It works seamlessly and in the background as people use your site. No code is needed and it’s super intuitive to set up recipes on your site. You can have your first recipe running in 5 minutes! We’re launching Uncanny Automator 1.0 with a full 65 triggers and actions. (Triggers are activities that Automator watches for, like making a purchase or submitting a form. Actions are things that happen as a result of triggers, like sending an email, adding a tag in Active Campaign or enrolling a user in a course.) Since each recipe can have unlimited triggers and actions, you can literally create millions of different recipe combinations to make your site the way you want it to work. Compare that with other integration plugins, which often connect 1 plugin with 1 other plugin in a very specific way. And if that dedicated plugin doesn’t work the way you want, you could be looking at thousands of dollars in development costs for a custom solution that’s still very inflexible. Just in case 65 triggers and actions and support for 15 different plugins at launch isn’t enough for you, version 1.0 has support for Zapier webhooks. This means you can connect your WordPress site and plugins with over 1,000 non-WordPress apps. 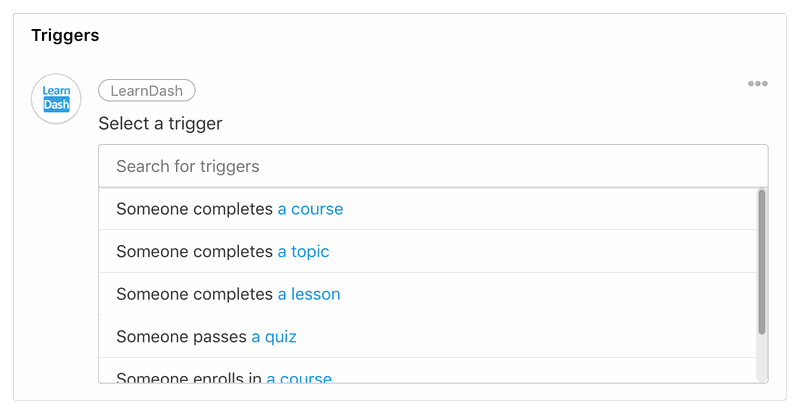 You can have your WordPress site trigger zaps (and coming soon, have Zapier trigger things on your site). Still not enough? We’re on track to support over 100 triggers and actions along with powerful new features by Christmas. Whatever type of WordPress site you have, Uncanny Automator can make it even better. Ecommerce site? Have purchases trigger personalized emails or unlock content. Or maybe orders with certain criteria, like dollar value, should set or remove a tag in your CRM (this requires the WP Fusion plugin). You might even combine purchase behaviours with page visits to trigger sales emails and drive more purchases. eLearning site? There is simply no more powerful way to build personal learning paths, anywhere. Maybe one course unlocks the next course. Or create powerful interventions, like having poor score trends enroll the user in a remedial program, suggest additional support interventions and notify their teacher or manager. You can even have H5P and xAPI activity trigger recipes (with our Tin Canny plugin). Whether you run a simple blog, marketing site for your business, community website or something entirely unique, Uncanny Automator can streamline your site and eliminate manual work. Still not sure if Automator is right for you? We’re so convinced that you’ll benefit from using it on your site that we’re offering a 30 day, no questions asked refund policy. If you don’t like it, we’ll give you your money back. It’s as simple as that. Click here to get Uncanny Automator for your website! Hooray! One of the most grandiose WordPress plugins came out! Thanks Oleg! 1.0 is pretty great on its own, but some of the things planned for versions 2 and 3 will fundamentally change how you can script things on your WordPress site. I’m afraid you’ll have to wait about 6-8 weeks for more news there. It’s coming though! New Front End Quiz Reports What’s New in LearnDash Toolkit Pro 2.5?